It makes absolutely no sense to purchase an expensive pair of hiking boots if you don't know how to keep your hiking boots safe. Take care of your hiking boots and your hiking boots will take care of you. Just remember that the boots are only the perfect boots if you learn how to take care of them. 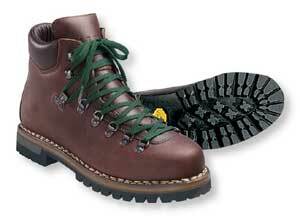 There are a few different types of hiking boots and each type has its own maintenance. The following are some helpful hints and tips to help you maintain your hiking boots. Consult the manufacturer for the proper products to put on the boots for waterproofing. Waterproof the boots before you use them for the first time. There are some conflicting thoughts on how to waterproof leather and they will be mentioned here. Some people advocate waxes, silicones or oil based products for leather boots. The thought is that wax or silicone based products will ruin the natural properties of leather and shorten the life of the boot. There is a difference between a paste wax and a water based liquid wax. Some boots require a water based wax while other boots require the paste wax. Whatever waterproofing is used, consult with the manufacturer for sure. Synthetic boots should use a silicone based waterproof product. Always make sure the attachment area where the boot and the sole meet have enough waterproofing. A very soft toothbrush or Q-tips will help get into those tough boot areas. Whatever waterproof product is chosen, use a reputable brand product for those expensive boots. When you have finished using the hiking boots for the day and you are ready to put them away, completely clean and wash the boots. Take the stones out of the bottom of the soles and remove all mud. A soft toothbrush with a little water will help clean those hard to get areas. If the boots become really scuffed, check to see if it is time to waterproof the hiking boots again. If the boots are damp and the inside boot pads can be removed, take the pads out to dry. Always wait until the boots have fully dried before putting them away. Always check the boot laces for potential lace breaks. Catch the defective laces before they break. Never use a fire, a hair dryer, a heater or any other outside source to dry hiking boots. It will damage the boots and might even affect how the boot fits. Always let the air dry the boots and don't leave the boots in the sun. The sole of the boot is attached to the boot with a special adhesive. Excessive high heat might cause the boots to come apart. The boots should dry slowly or else the leather might crack. A light amount of regular foot powder or baking soda will remove most of the boot odor. Just don't over do and use light amounts. If you are a seasonal hiker and the boots are only used for a couple of seasons, don't store the boots in a cold attic or a hot basement for an extensive period of time. Keep the boots in a place that have normal air temperature. Always put them on every once and a while to keep the proper shape of the boot and also to keep the leather soft. No boots can be used for the first time hiking without breaking in the boots first or your hiking experience will go downhill after the first mile. Wear the boots in an easy environment such as around the house. Then go for short walks around the block, etc. Once your feet feel ok, the boots are ready to go. If the boots still don't feel comfortable, bring them back to the retail store to see if any adjustment can be made. My feet swelled due to drinking large quantity of water and high altitude. Both my little toes were pressed against the inside lining of the boots while hiking and I didn't want to lose a toe nail. I found a small boot repair shop that evening in town and he put a boot stretcher on those two pressure spots that my little toes touched. The next day, the boots fit great. Always try to solve the problem before the boots become uncomfortable. Always keep the boots laced when walking around wearing the boots. The laces will keep the hiking boots in the shape that the boots were intended to be in and not having the laces tied might possibly damage the laces. Have fun backpacking and don't forget to take care of your hiking boots when you return from your hike.